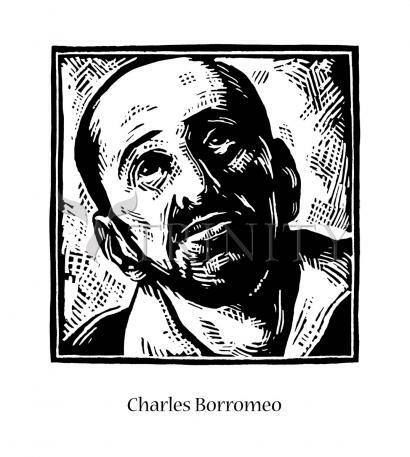 Born into a family of nobility and wealth, Charles Borromeo was created a cardinal at the age of 22. He did not cling to riches or privilege but rather spent his life and fortune in the service of God's people. He led by example, founding schools for the poor, seminaries, and hospitals, and tending personally to the sick and dying during the plague. Charles was especially dedicated to the reform of religious life and the priesthood. "If teaching and preaching is your job, then study diligently and apply yourself to whatever is necessary for doing the job well. Be sure that you first preach by the way you live. If you do not, people will notice that you say one thing, but live otherwise, and your words will bring only cynical laughter and a derisive shake of the head." His feast day is November 4. Charles was born to a wealthy, noble family, the third of six children, son of Count Giberto II Borromeo and Margherita de' Medici. He was the nephew of Pope Pius IV. Charles suffered with a speech impediment. He studied in Milan, and at the University of Pavia, studying at one point under the future Pope Gregory XIII. He was a civil and canon lawyer at age 21. Charles was a Cleric at Milan, taking the habit on 13 October 1547 and Abbot commendatario of San Felino e San Graziano abbey in Arona, on 20 November 1547 as well as Abbot commendatario of San Silano di Romagnano abbey on 10 May 1558 and prior commendatario of San Maria di Calvenzano abbey on 8 December 1558. Charles was Protonotary apostolic participantium and referendary of the papal court to Pope Pius IV on 13 January 1560 and a member of the counsulta for the administration of the Papal States on 22 January 1560. He was appointed abbot commendatario of Nonatola, San Gallo di Moggio, Serravalle della Follina, San Stefano del Corno, an abbey in Portugal, and an abbey in Flanders on 27 January 1560. He was created cardinal on 31 January 1560 at 22. Charles was an apostolic administrator of Milan, Italy on 8 February 1560, a Papal legate to Bologna and Romandiola for two years beginning on 26 April 1560, a Deacon on 21 December 1560, a Vatican Secretary of State, a Governor of Civita Castellana in 1561, a Governor of Ancona on 1 June 1561 and made an honorary citizen of Rome on 1 July 1561. He founded the Accademia Vaticana in 1562. Charles was Governor of Spoleto, Italy on 1 December 1562 and Ordained on 4 September 1563. He helped re-open the Council of Trent, and participated in its sessions during 1562 and 1563. He was named prince of Orta in 1563, became a member of the Congregation of the Holy Office, a Bishop of Milan on 7 December 1563, and President of the commission of theologians charged by the pope to elaborate the Catechismus Romanus. Charles worked on the revision of the Missal and Breviary. He was a member of a commission to reform church music. He became Archbishop of Milan on 12 May 1564 and Governor of Terracina on 3 June 1564. He was the Archpriest of the patriarchal Liberian basilica in Rome in October 1564, the Count of the Palatine in 1564, the Prefect of the Tridentine Council from 1564 until September 1565, the Papal legate in Bologna, Romandiola, legate a latere, and vicar general in spiritualibus of all Italy on 17 August 1565, the Grand penitentiary on 7 November 1565, and participated in the conclave of cardinals in 1565 to 1566 that chose Pope Pius V.
As Protector of the Swiss Catholic cantons; he visited them all several times and worked for the spiritual reform of both clergy and laymen. Due to his enforcement of strict ecclesiastical discipline, some disgruntled monks in the Order of the Humiliati hired a lay brother to murder him on the evening of 26 October 1569; he was shot at, but was not hit. Charles participated in the conclave in 1572 that chose Pope Gregory XIII and was a member of the Apostolic Penitentiary in May 1572. He worked with the sick, and helped bury the dead during the plague outbreak in Milan in 1576. He established the Oblates of Saint Ambrose on 26 April 1578 and was a teacher, confessor and parish priest to Saint Aloysius Gonzaga, giving him his first communion on 22 July 1580. To help the Swiss Catholics he founded the Collegium Helveticum. I admit that we are all weak, but if we want help, the Lord God has given us the means to find it easily. Would you like me to teach you how to grow from virtue to virtue and how, if you are already recollected at prayer, you can be even more attentive next time, and so give God more pleasing worship? Listen, and I will tell you. If a tiny spark of God's love already burns within you, do not expose it to the wind, for it may get blown out. Keep the stove tightly shut so that it will not lose its heat and grow cold. In other words, avoid distractions as well as you can. Stay quiet with God. Do not spend your time in useless chatter. We must meditate before, during and after everything we do. The prophet says: "I will pray, and then I will understand." This is the way we can easily overcome the countless difficulties we have to face day after day, which, after all, are part of our work. In meditation we find the strength to bring Christ to birth in ourselves and in other men.